Here is somthing that ALL OF YOU TEACHERS will want to check out. I believe it is possibly the most important thing I have found on the Internet. It is a MASSIVE, and I do mean, massive electronic database for publications since 1988. 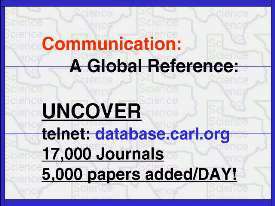 The Carl Organization in Denver operates this database, and it consists of more than 17,000 journals. EACH DAY they add more than 5,000 papers to the database! You can go to this either through the Internet by clicking the telnet. Be sure to configure your browser to simply "telnet://database.carl.org" and then follow the instructions. It is free to VIEW the papers you get from your menu choice. I usually simply copy and paste them to my Notepad and then go to the library and check the ones I am interested in reading. Of course, if you have lot's of $$$, you can actually have Carl FAX any of the millions of articles available. Just click below which citation format you desire. Now here is a very inexpensive way to have CARL work for YOU! Simply for only US $25.00 per year you can subscribe to the UncoverReveal . This allows you to name 25 key words and approximately 50 journals, from which CARL will extract information and email it to you weekly. Yes, your email box will become quite full, but simply make another mailbox in which to store the incoming data, then download the data to your ENDNOTE file where you can build your own database. I suggest ENDNOTE since this is such an important bibliographic resource for standardizing the formatting of references. Remember, when you do this, you will not ever have to write the article again.